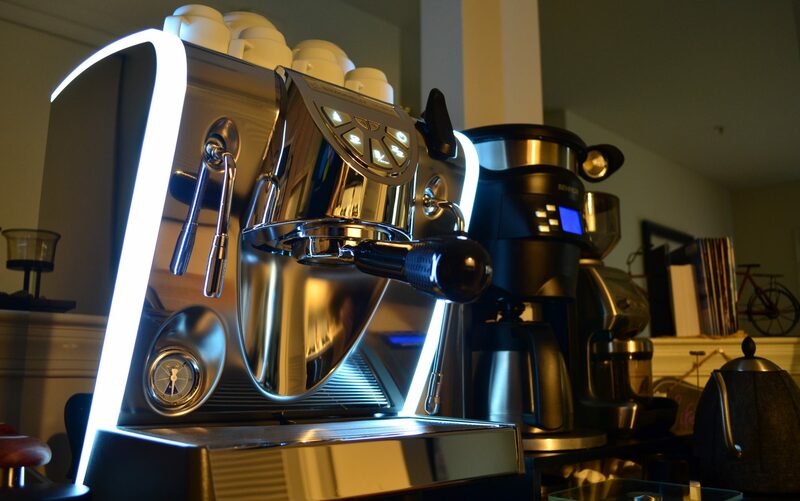 Crazy price: the Nuova Simonelli Musica Lux (with the LED strips) retailed new for $2500 for the tank model while the Oscar retailed for close to $1000 and the Oscar 2 for close to $1300. Keep in mind, these machines are nearly identical except for the price and couple of other changes. I purchased this machine for close to $1000 so depreciation is crazy on these machines. Missing brew pressure gauge: for $2500, you would think that a brew pressure gauge (feature found on much cheaper machines) is a given but somehow the folks at Nuova Simonelli didn’t think so, so you only get a boiler pressure gauge. 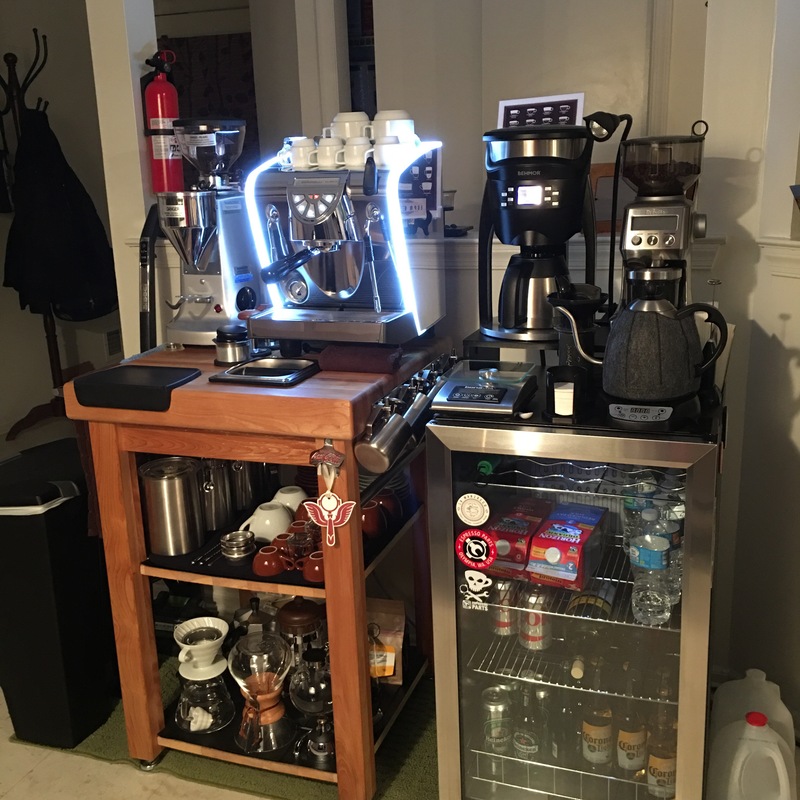 Unnecessary NSF certification: for some reason Nuova Simonelli thought that certifying a machine like the Musica, with its vibratory pump and 2 liter boiler, was a good idea. The certification was intended to make the Musica a viable option for small, low volume commercial application (e.g. galleries, small restaurants, etc.). However, the vibratory pump is ridiculous with its 1 minute on 1 minute off requirement and the heating element is only 1200 watts. The high price (for what the unit offered) and the reliability concerns all played important roles in making this machine a nonviable option for the commercial or even semi commercial environment. Can’t choose between plumbing and tank after purchase: the Musica must be purchased as either a tank (pour over) model or a plumbable model. You can’t plumb the tank model if you choose to after buying the machine and you can’t use a tank with the plumable model. Again, for the price, the option to switch between tank and plumbing should have been a given. Pre-infusion time is not adjustable: the Musica has a pre-infusion option, which you can turn on and off using the keypad, but the length of the pre-infusion is already set at 3 seconds and is not adjustable. In the next post I will talk about the things I like about the Musica and why it’s a good buy in the used market. How Involved Should Your Business Be in Politics? The short answer? Not at all! Here’s my logic on this. Currently, the nation is extremely divided and what that means is that if you, as a business, take the left’s position on a social or political issue, you risk alienating the right and if you take the right’s position on a social or political issue, you risk alienating the left. These are all issues that the left and right can get behind and won’t risk alienating people on either side. If you, the owner of the business, feel one way or the other on some hot button social or political issues such as immigration or refugees you may want to consider keeping your opinion out of the business. 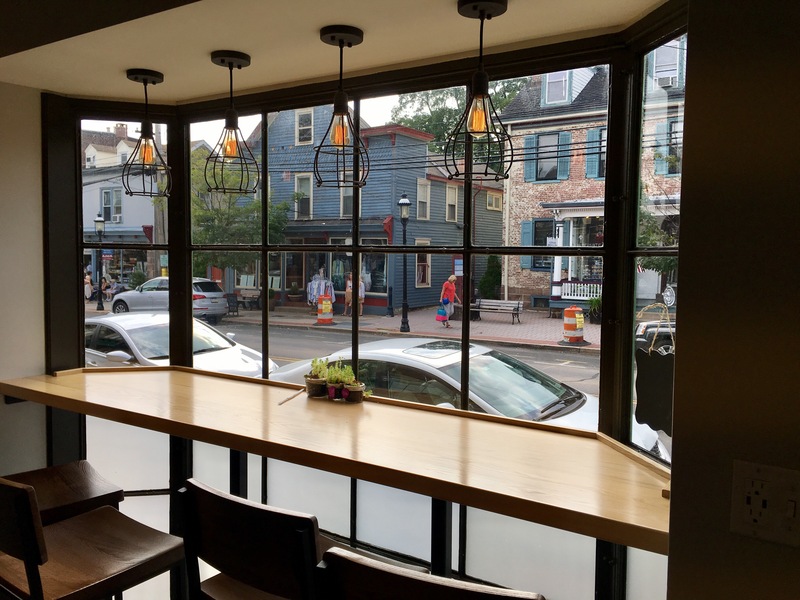 You may use your personal social media accounts or other personal platforms to publish your personal opinions while making sure that your customers understand that those opinions are yours and yours only and do not reflect the views of XYZ Coffee Company. I understand that if you have a physical location/coffee business it may be tempting to attach your business to the political opinion of your business’s geographical location. 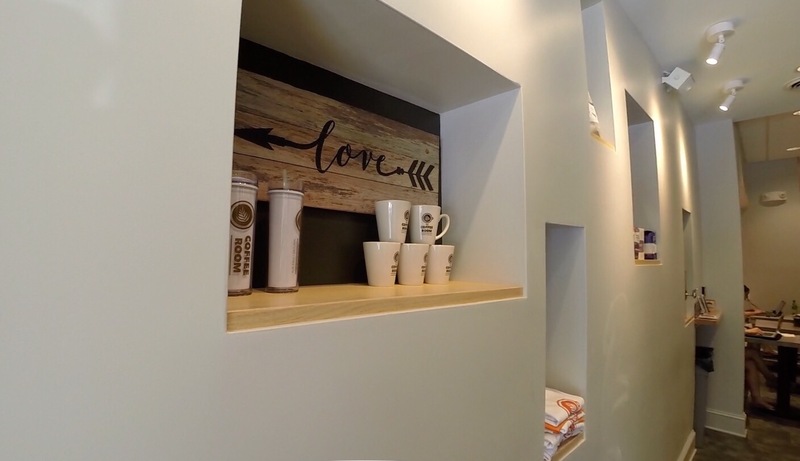 An example can be a coffee business located in San Francisco, California, where it is predominantly liberal, taking a liberal position on illegal immigration. The issue with doing this is that you may be limiting your business if you are selling coffee and coffee products online or if you have plans to expand your business beyond your current location. 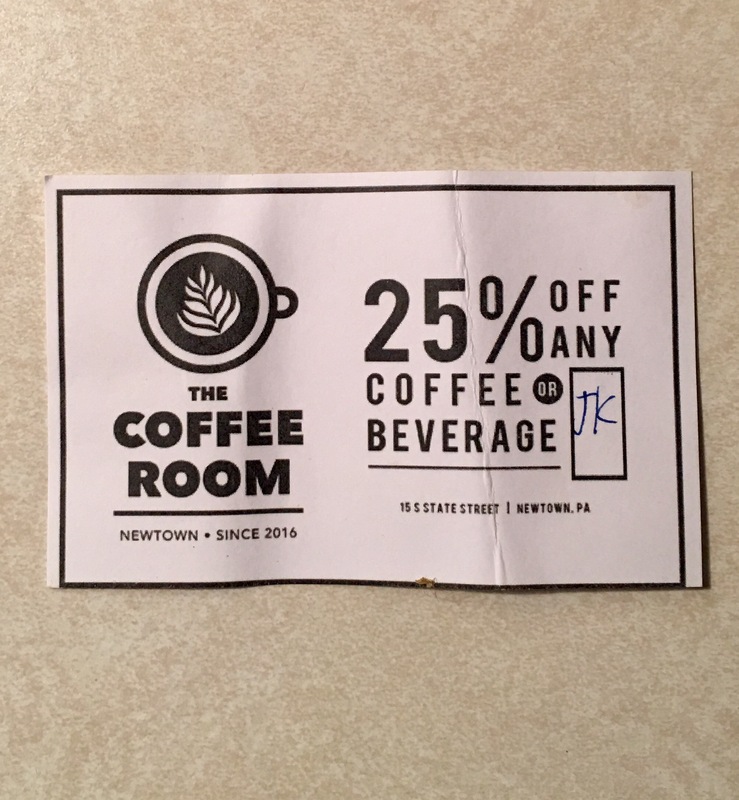 A customer located in a predominantly conservative city/state such as Texas, who loves your freshly roasted coffee, may end up taking their money elsewhere. The backlash Starbucks received after their decision to hire refugees is a great example as to why businesses shouldn’t dive into politics. This article from Fortune.com talks about the boycott Donald Trump’s supporters have initiated and financial impact on Starbucks as a result. Staying politically neutral is best for your business. Very few things are more frustrating than ordering a drink or a meal and you love it but then when you go back to the same place and order the same drink or meal, it comes out different. Consistency is much more obvious for brick and mortar coffee shops but unlike serving coffee from a fixed place where the same people may stop by every day for their daily dose of caffeine (the frequency of order from the same customer is not as spaced out as with a catering customer), coffee catering is mobile and you may end up serving different people every day so why does consistency matter? 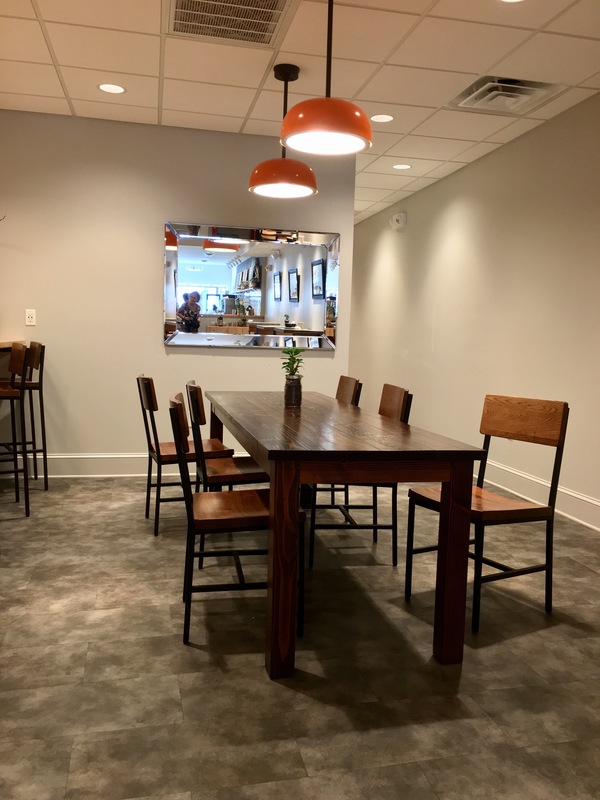 It matters because with coffee catering you may still serve repeat clients. Think about a situation where you were hired by a company to serve a group of 50 employees who are out in a resort or a hotel for their annual conference or new products launch. In this case, you will be serving the same customers every day and so consistency will matter. A client (company) who will hire you once and receive a mixed feedback will probably not be a repeat client. 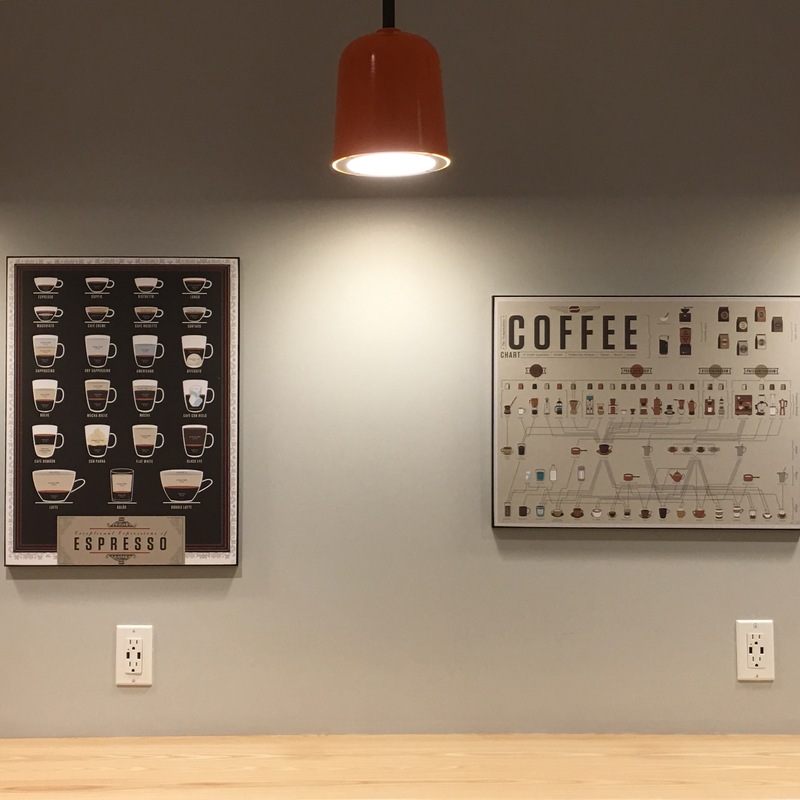 This brings us to an important question, how can you achieve consistency in the coffee catering business (some of these concepts apply to brick and mortar as well)? I have narrowed the answer down to two main factors: 1) People and 2) Equipments and Supplies. In the table below, I summarized qualities required in every category to achieve consistency. While browsing coffee gear and coffee-related posts on Instagram, I stumbled upon a post by Socraticcoffee showing The Force Tamper and indicating that a review of this tamper is on its way. Looking at the tamper, I was intrigued. Every tamper out in the market that promises a leveled tamp has to be manually adjusted to accommodate different doses. What do I mean by that? Basically, self leveling tampers that promise a perfectly leveled tamp and a consistent pressure works by manually setting the travel distance of the tamper base to a set level and this level is controlled by your dose. In other words, if you dose 19gm in the basket and you adjust the travel distance of the tamper to tamp down at let’s say a 30 lb of pressure but then if you decide to dose 21gm or if you change coffees (and the new coffee has different density) or if you use different size baskets then you will have to adjust the travel distance of the tamper or you will be tamping too much (or too hard) before the leveling base reaches the basket for a leveled tamp. Once Socratic confirmed that this tamper provides a perfectly leveled tamp regardless of the dose, I was ecstatic and I reached out to the owner (Zubing Sun) on Instagram (@starmoonxp) and asked for more details. After some back and forth, The Force Tamper complete with multiple bases and handles, was on its way from China to New Jersey and I couldn’t be more excited. Once I unboxed my tamper, I wanted to see how the mechanism of this tamper works and to confirm my understanding of its uniqueness and so I disassembled most of the parts but before I show you the parts and components it is important to understand why this tamper is unique. In my mind, the perfect tamper is a tamper that tamps level while applying consistent amount of force or pressure. All tampers on the market that I’m aware of (before the release of The Force Tamper), promise either a leveled tamp (by having a base that sits on top of the tamper), or a consistent pressure, or both as long as your dose is consistent and your coffee is the same. Never existed a tamper that promises a leveled tamp, a consistent pressure regardless of coffee, basket size or dosage (more on that later) without any adjustments! What makes this tamper unique and what ensures the consistent pressure is the method it employs to apply the force to the coffee. Most tampers on the market that regulate the pressure applied to the coffee in the basket, do so by using some sort of feedback function such as a click or a compression spring that’s designed to provide a preset level of pressure. The Force Tamper unique design is different. Pressing down on the handle of The Force Tamper compresses a spring, then at a point controlled by an internal mechanism, the spring is released pushing or punching a piston down onto the base and then the bases compresses the coffee. This genius of this mechanism is what eliminates the need to adjust the tamper travel distance, like with other tampers, every time you need to adjust your dosage or change coffees. The pressure or amount of force applied can be adjusted. You can do so by unscrewing the handle from the tamper then you will find what looks like a washer (t’s not) with two dents or bumps (see picture below). Grab a coin, then insert it in the two holes and rotate clockwise or counterclockwise. Clockwise will increase the pressure (or punch) force applied to the coffee and counterclockwise will decrease he pressure (or punch) force applied to the coffee. I have embedded below a video I made showing how you can easily adjust the pressure. From the day I saw Socratic’s post on Instagram, I knew that this tamper is a game changer and once I received it and started using it, I was sold. The Force Tamper with its perfect leveling and consistent pressure tamping, practically eliminates tamping as a cause of bad extractions. Also, for cafes with multiple baristas or multiple locations it helps uniformize tamping. Finally, for working baristas, The Force Tamper eliminates elbow and wrist injuries caused by hours of tamping as you only need to hold the portafilter and tamper still while pushing down on the handle. I have made a video review of the tamper as well. Enjoy! Disclaimer: I received the tamper in exchange for my honest and unbiased review. As someone who’s been working in the coffee catering business for some time, I have the opportunity to experience and observe the business first hands. 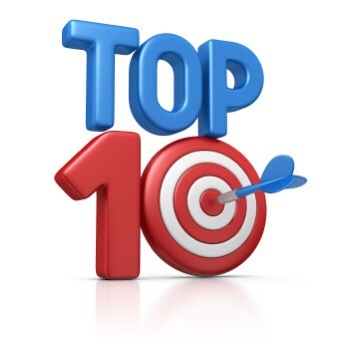 The 10 to-do things below are things I see all the time and things that I would personally do if I ever start my own coffee catering business. The advice below will make it easier to operate the business smoothly and successfully. Use 110/120V equipments: this one is a little tricky because most heavy duty commercial machines are 220/240V and catering work requires commercial machines. The good news is you can still buy 110/120V commercial equipment but you will have to look a little harder than if you were buying 220/240V. 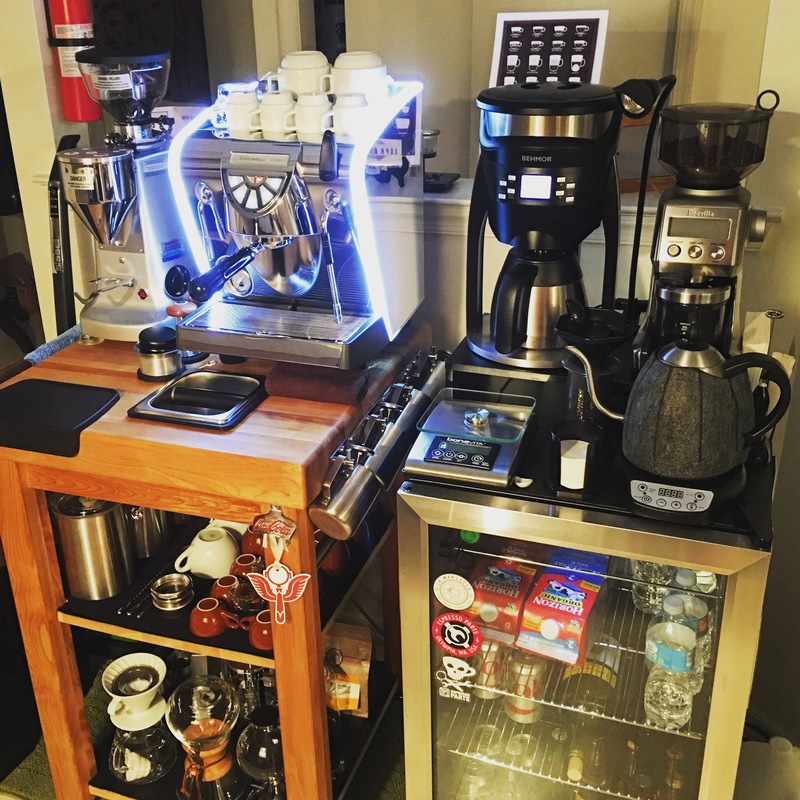 Use new equipment whenever possible: used/second hand coffee equipment may seem like a good value at first glance but look deeper. Used equipment, especially ones without service records or invoices for all the work done, can cost you a lot of money in the long run, making any financial benefit of their lower price questionable at best. Think of a scenario like this you find a second hand machine for $2000 and new the same machine goes for $4000. At first, this seems like an excellent deal, a 50% discount off the original brand new price but look deeper. Getting a commercial machine with heat exchanger or a dual boiler professionally descaled can cost upward of $300 (scale buildup in the boiler is common if hard water is used)! Replacing a solenoid valve can cost upward of $150 per group. This number can be $300 or $450 for machines with 2 or 3 groups. Rotary external pumps is another item that can cost upward of $350 with installation. Adding any combination of some of these items together may cost you anywhere between $500 to $750 and this is only for parts and maintenance without taking into consideration any opportunity costs. What opportunity costs you ask? Imagine this, you’re doing an event and you are serving for 2 hours, after one hour and when you’re having a line of people waiting for their drinks, the machine acts up and starts losing pressure. An incident like this may cost you explicitly and implicitly. The lost money/profit you’re making off of the event (or whatever compensation you will offer to the venue or the event manager) is your explicit cost but what about implicit costs such a as damaged brand image and reputation? Adding all this up, you can easily see why buying new is the way to go. Finally, new machines have warranties, so even if something were to go wrong with a new machine, the fix is one service call away. No out of pocket cost for repairs and parts. Buy your equipment from local, close by vendors: last thing you need, if something were to go wrong with your equipment, is to have to ship your machine or drive for hours to a service center. Shipping will not only cost you a lot of money (machines are heavy), but the reckless way UPS and FedEx handle large, heavy packages/ shipments will likely cause damage to the machine and result in more work for your technician. Always have a backup machine and grinder in your van: this may seem like a waste of money at first but look deeper. A backup machine and grinder can be the difference between a happy customer and a successful event and miserable customer and a nightmare event. If you’re still not sure where the nightmare will come from, go back to my second point and the part I talk about implicit and explicit costs. The good news here and to save money, your backup machine can be a used one, why? Because a backup machine is just that, a backup machine, it’s only used in case of an emergency. This is not your main work horse and its sole purpose is to help save the day when your main work horse is out in the middle of an event. Don’t buy machines with 2 or more groups: instead of buying one machine with 2 groups, buy 2 machines with one group each. This may seem like counterintuitive and inefficient at first glance but look deeper. Buying 2 one grouphead machines is better than buying one machine with 2 grouphead for the following reasons: 1) If a machine with 2 groups goes down, that’s 2 groups out. If a machine with one grouphead goes down, no problem use the other one grouphead machine. 2) one grouphead machines are lighter, easier to use and carry. They are also easier and cheaper to maintain 3) many baristas cannot multi task to take advantage of both groups. The end result is one group is used way more than the other. Your image, your image, your image: I can’t stress that enough! Your business and brand image are critical for your success. If you think showing to an event with a faded black shirt or a shirt missing buttons is not important, think again. If you think showing up with a nasty machine is no big deal, think again. If you think using a 20 year old banged up van is okay, think again. Every little detail matters. Your equipment, shirts, looks, van, etc. say a lot about you. A nasty image give people the perception that you don’t care and no one wants to do business with someone who doesn’t care. Your van is a mobile billboard advertising for your business so make sure it’s clean, in good shape and a good representation of your brand and company. Don’t hire people who don’t drink coffee or can’t drink it late at night: this may seem obvious but you need to make sure your employees are comfortable drinking coffee late and/or at any time, why? Because your employees must be able to taste the coffee before serving it to the guests. Someone who can’t drink coffee after 5 pm because “it keeps me up at night” won’t be able to dial in the machines and taste the espresso shots/coffee to ensure it’s good for the guests. Going by coffee color, flow and crema is not enough to ensure good tasting coffee, a good Barista must be able to drink coffee before the start and during the event to ensure consistency. Maintain an exact set of brewing parameters and define your drinks: Ideally, you want repeat customers to taste the same coffee and drink the same beverages. The last thing you want is for a client to hire you for an event and love your coffee then hire you again just to taste different coffee! Imagine how annoyed will you be if you go to McDonalds, order their McMuffin and love it just to go the next day to order another McMuffin and have it taste different, missing ingredients or have ingredients you don’t necessarily like. Consistency is key, not just to maintain clients but also to diagnose issues. If you were hired by a client for an event then the following event you learn that they have hire someone else, having consistent drinks will rule out quality as the reason why you didn’t get the job. It could have been pricing, customer service, presentation, etc. but definitely not the drinks. Also, make sure those parameters are listed on your menu and don’t deviate from them unless explicitly asked by the guest. Focus your energy on straight espresso orders: pulling straight espresso shots (single or double) is very important since they will not be diluted with milk, syrups, whipped cream, etc. the espresso quality in this case is extremely important. Any bad flavors or weaknesses will be totally exposed. On this topic, always ensure that you do a cooling flush before you pull a shot. Running some water through the grouphead helps stabilize the brewing temperature and clean the shower screen of old grounds from the previous shot. Fresh coffee makes a huge difference in taste: Ensuring your coffee is fresh for all events is critical as it helps ensure consistency. Don’t store the coffee in its original bag, use a vacuum sealed coffee storage canisters. This won’t eliminate coffee deterioration as time goes by but it will at least slow it down. 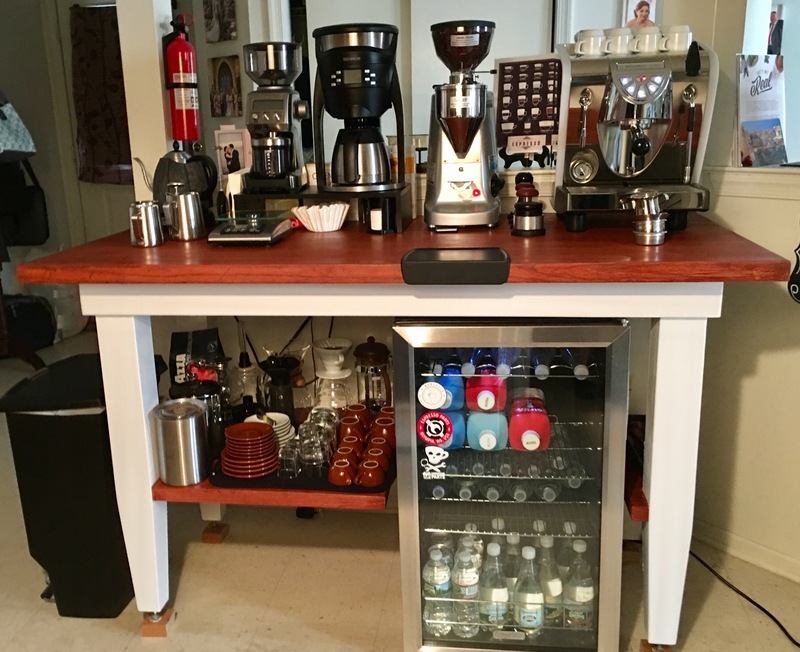 If you haven’t read my previous post about my coffee equipment and station, please do so before reading this post as it will give you a better idea as to how different this new station is. 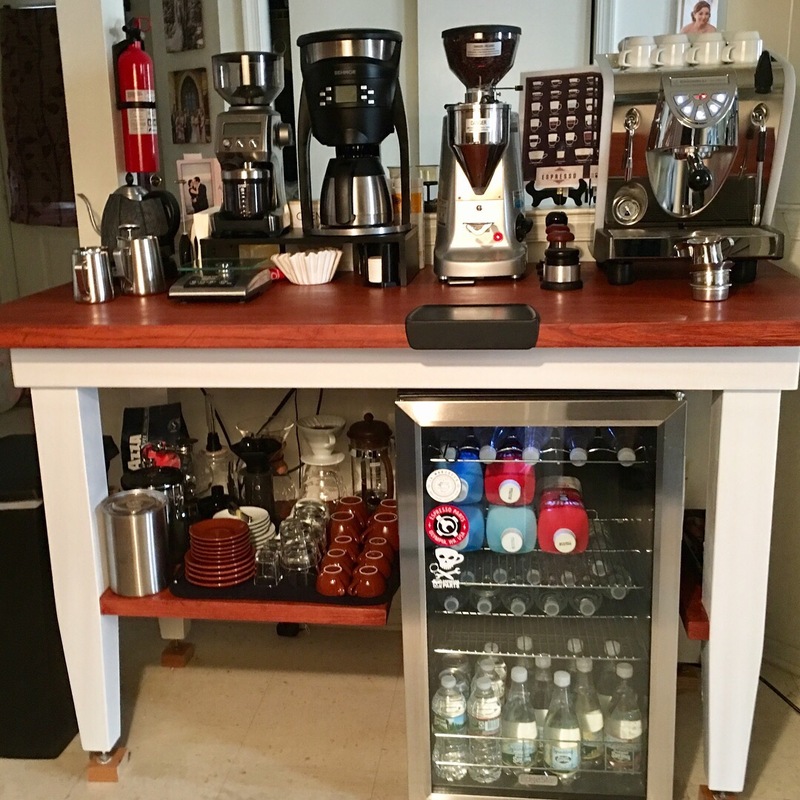 As you can see, it’s nice but not enough space to prepare the coffee or the espresso shot and definitely no room to add more accessories or gear in the future. 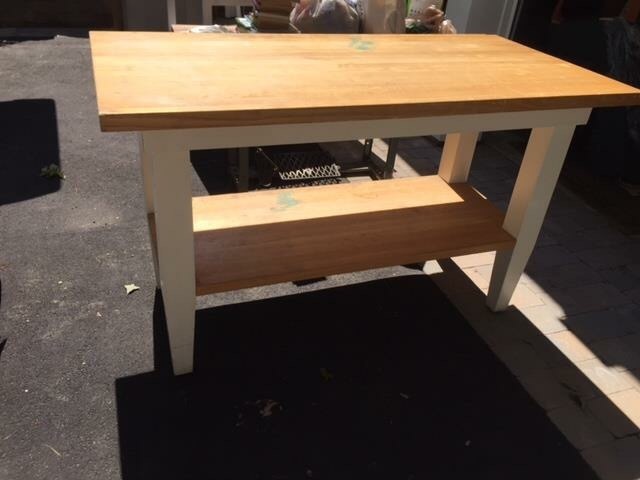 I finally found the perfect table, it’s a butcher block, measures 60x30x34.25 inches and looked like it was built like a tank, one issue though, I live in New Jersey and the table was in Long Island, New York. 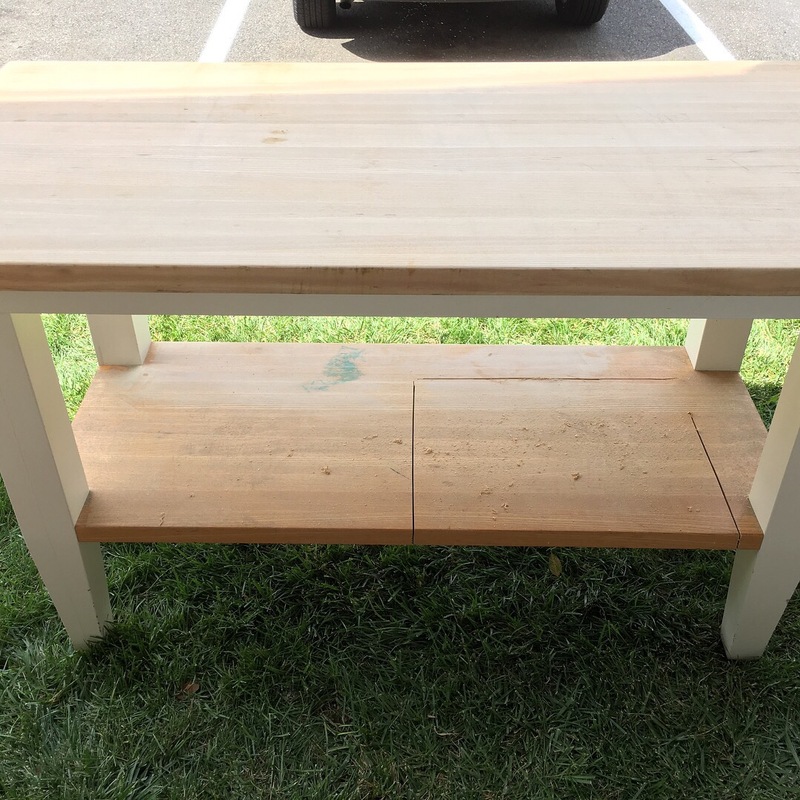 The table was listed on Facebook marketplace for $75 and I negotiated it down to $60, which is a discount that helped offset the cost of tolls and gas. It was a Saturday and I borrowed my mom’s Chevrolet Equinox (I measured my wife’s Jeep and the table wouldn’t fit) and my wife and I decided to make a day out of it. We left New Jersey heading to Long Island around 10 am and was there, on time, at 11.30 am. The table didn’t fit all the way in the car and so we ended up leaving the trunk slightly open but tied down with ropes and bungee cords. 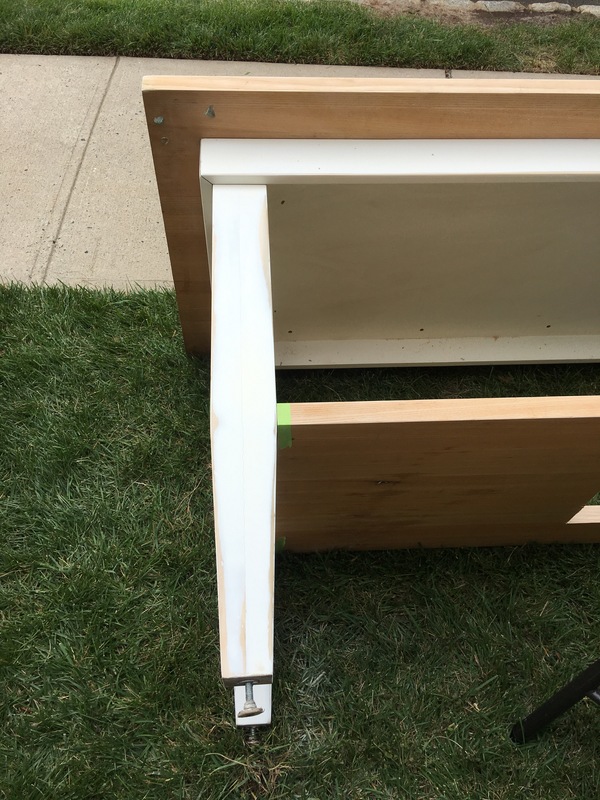 Upon arrival and further inspection, I noticed that there are some deep scratches that will require some major sanding and paint chips on the white paint, which will require sanding and repainting. 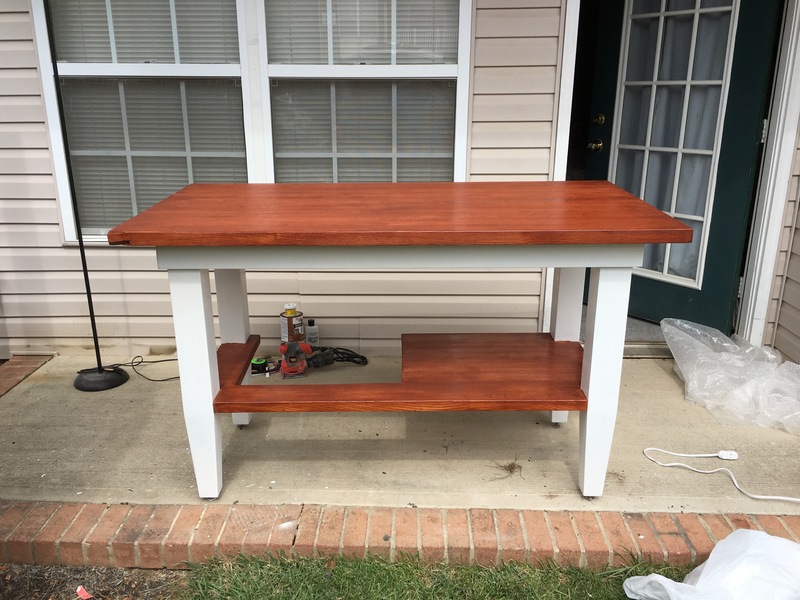 Here’s a picture of how the table looked like when I went to pick it up. On the way back from New York, I went to Home Depot and purchased white semi gloss paint, wood stain, 2 paint brushes and sandpaper. The supplies cost a little less than $40, bringing the total cost of the table to just under $100, not including tolls and gas. As soon as I got back home I went to work on the table and called my father and asked him for help. Luckily, he was free the whole day Sunday and told me that he will stop by first thing after church to give me a hand. Once the cutout was done we started sanding the white paint to remove the paint chips and prepare the surface for a fresh coat of paint. 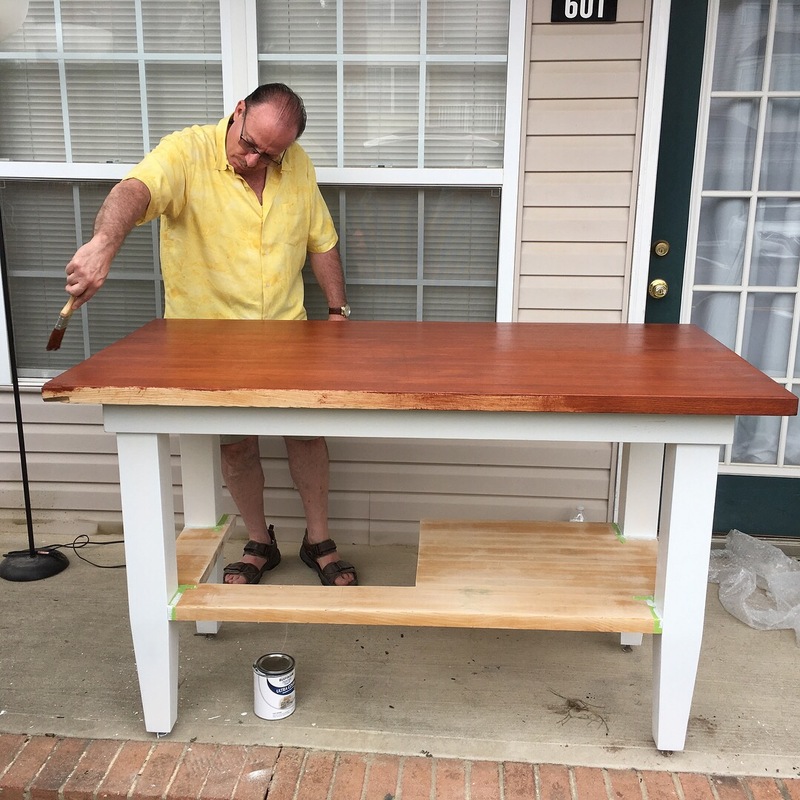 Once we laid down the white paint, we started staining the tabletop and the shelf. 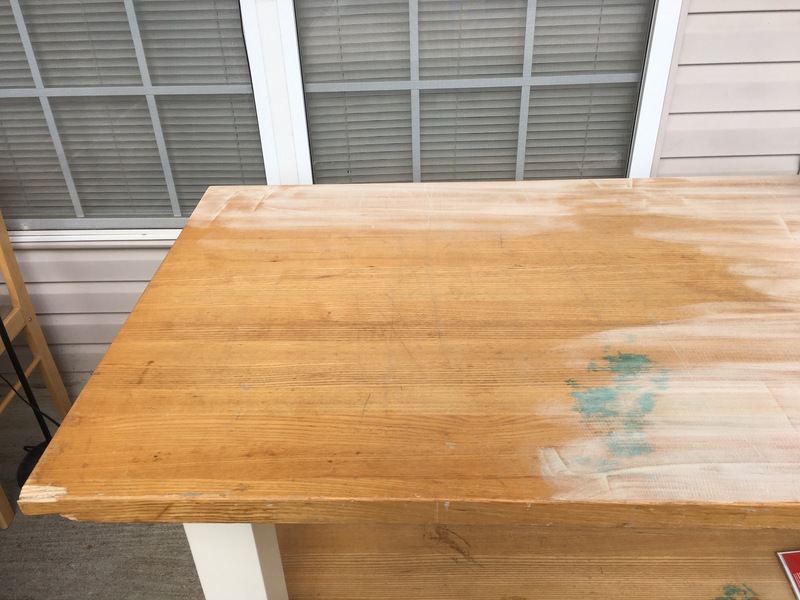 Once the staining was done the table was pretty much complete. The tougher part was lifting this beast and bringing it inside the house, this required my wife’s help as my father’s back has seen better days. Once inside I proceeded to arrange my stuff and admire the weekend’s worth of hard work….and it was beautiful! 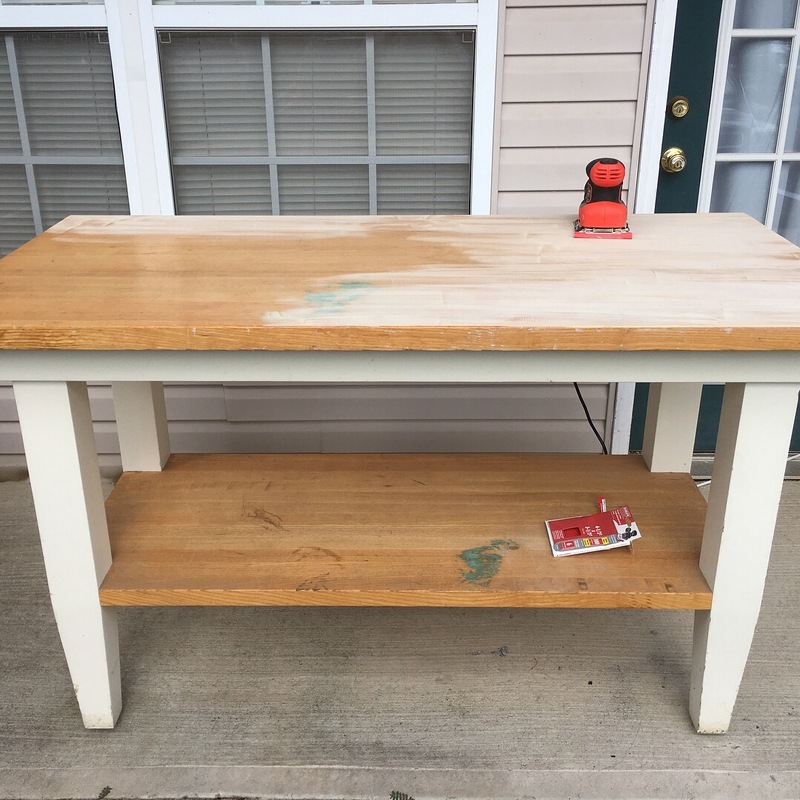 These are pictures showing my old and new espresso/coffee tables. Please let me know what you think in the comments below or if you have suggestions for updates or a better layout.